I've mentioned my feelings about kimchi in one or two previous posts. It scares me. It's foreign, it's fermented, and it's cabbage. It's just a bit intimidating. And it's not just kimchi that terrifies me, but all forms of fermented cabbage, like sauerkraut. But you can't say I'm not a trooper. I've eaten sauerkraut on hotdogs and with porkchops. I've tried kimchi in fine Asian restaurants, mostly Korean barbecue places. And I've tried multiple different kinds of it. I did appreciate some of the varieties a little more than the traditional cabbage-based one, but none so much that I'd snack on them on any normal occasion. I just can't get into it. Recently, an excellent article about fermented foods by Ellen Byron went up on the Wall Street Journal site. (If that link takes you to a "Get the Full Story" screen, that means they've placed the article behind their paid subscriber wall). And it really got me thinking. It got me thinking that if a delicious condiment like Sriracha is actually fermented, a fact I was previously unaware of, that maybe I should give this whole kimchi thing another whirl. I thought that maybe the dryness of this Trader Joe's product would cut down on the grossness of the kimchi. When it's all wet, I just can't get it out of my mind that it's cabbage being broken down into a liquid slowly by millions of little bacteria. So, after postponing the consumption of the dried kimchi as long as possible, I finally decided to be brave and open the bag. There were dozens of chunks of dried kimchi with a dusting of a powdered version of the traditional red spices you'd find on any regular kimchi. It looked and felt like the bag of kale chips I reviewed a while back. The taste, however, was very different from the kale chips. Chalk it up to my aversion to kimchi if you must, but I simply can't recommend this stuff like I did that delicious bag of dried kale coated in a weird nacho sauce. This stuff STILL TASTES LIKE ROTTING CABBAGE! I found it a shade more palatable when I ate it in a bowl of ramen instead of straight out of the bag, but in the former case, it gets wet again. I imagine that the millions of little bacteria responsible for the sourness of the cabbage have been in suspended animation for months, and then when I drop it into my bowl of warm soup, they come to life again like a package of Amazing Live Sea Monkeys and begin swimming about, devouring bits of cabbage and ramen, rushing to establish a culture of their own in my bowl before I can gag them all down and digest them. My wife Sonia, who generally appreciates regular kimchi, felt like TJ's Dried Kimchi was mostly flavorless. I disagree. I think it tastes sour like authentic rotting cabbage. And I also tasted the spices, which I might have actually enjoyed if they were sprinkled onto, say kale, instead of ... rotting cabbage. Neither Sonia nor I could ever feature ourselves buying this again, but perhaps for slightly different reasons. I can only recommend trying this product if you're a big fan of regular cabbage-based kimchi. I know you kimchi fans are out there, and I wish I could join your ranks. But this is one food I fear I may never fully develop an appreciation for. Sonia gives it 3 stars. I give it 2.5. Why would TJ's invent something like this??? dried kimchee? come on.. I'm an American born Korean.. so were my parents and they wouldn't eat anything like this- especially dried... TJ has gone off the deep end as far as some of their so-called Korean items which btw aren't true Korean. Who are they trying to fool now? Good point, KBF. A lot of their "foreign" foods are very Americanized. Or they're new concoctions that they're trying to pass off as traditional. have u done reviews on their so called Thai products? If so, what do u think of them? As a Korean, I also find this product a little strange. I've seen it at TJ for a while now but haven't had the courage to try it. I don't imagine it would be anywhere near as good as "normal" kimchi, but I can see it coming in handy in any situation where you want to have kimchi around, but don't want to store a stinky jar. For instance, I might like to have it at my office to put on ramen, and I can't keep kimchi in the office fridge here without raising a stink, so to speak. Also -- I just want to stick up for fermentation and good bacteria! Just some of the foods created by bacterial action: wine, beer, liquor, sake, cheese, olives, pickles, sourdough bread, chocolate, and all kinds of cured meats. Good bacteria are our friends! Thanks for your input, Edward! And you're absolutely right about fermentation...I just have a weird psychological barrier against certain foods. BTW, there is one usage this worked out O.K. for me: addition to simple cheese quiche. I am a great lover of kimchi, and when I read the title of this all I could think of is "...what???" drying kimchi just sounds like a terrible, disgusting idea to me. if this was even a remotely good idea I'm sure I would've seen kimchi chips in every convenience store in korea, but among all the foreign strange-sounding snacks I encountered, dried kimchi was not one of them. a pox on whoever decided this was a good idea to make. I'm taking this backpacking this weekend. Seems like a great way to enjoy kimchi on the trail...it's light, requires no refrigeration, you can throw it into ramen, etc. Always looking for ways to add more vegetables to trail food. I really like kimchi, and I enjoy eating novelty foods that many may find unpalatable. This stuff is disgusting. 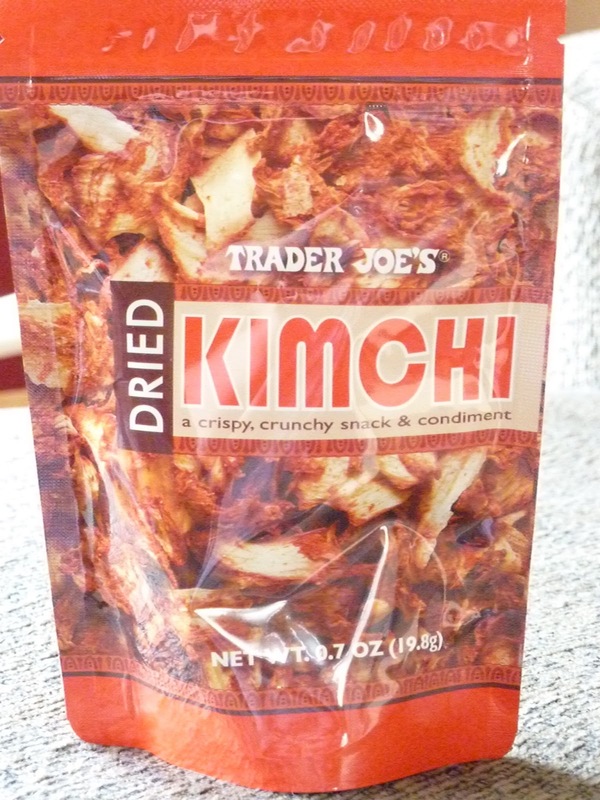 I'm an LA native and I have not seen this dried version at TJ's, although I have seen the fresh Kimchi. I tried it, not that great, but appreciated that they collaborated with a factory in Korea. Fermented foods are not for all, and I appreciate your valor in trying various kinds of Kimchi. There are over 500 different kinds varying per season/combined. All the best! ps - who the hell would want to eat Kimchi jerky? Nope. BTW, I am Korean and some things are best kept as is! LOL. Thanks for your thoughts. Yeah...Kimchi jerky. That's basically what this is.